Having launched LPG marketing in the mid-60s, IndianOil has been credited with bringing about a kitchen revolution, spreading warmth and cheer in millions of households with the introduction of the clean and efficient cooking fuel. It has led to a substantial improvement in the health of women, especially in rural areas by replacing smoky and unhe- althy chulha. Indane is today an ideal fuel for modern kitchens, synonymous with safety, reliability and convenience. With the status of an exclusive business vertical within the Corporation, Indane is delivered to the doorsteps of 11 crore households. IndianOilï¿½s 91 Indane bottling plants in upcountry locations roll out 2 million cylinders a day, making IndianOil the second largest marketer of LPG globally, after SHV Gas of The Netherlands. Indane is available in compact 5 kg cylinders for rural, hilly and inaccessible areas, 14.2 kg cylinders for domestic use, and 19 kg and 47.5 kg for commercial and industrial use. LPG is a blend of Butane and Propane readily liquefied under moderate pressure. LPG vapour is heavier than air; thus it normally settles down in low-lying places. Since LPG has only a faint scent, a mercaptan odorant is added to help in its detection. In the ev- ent of an LPG leak, the vapourisation of liquid cools the atmosphere and condenses the water vapour contained in it to form a whitish fog, which is easy to observe. LPG in fairly large concentrations displaces oxygen leading to a nauseous or suffocating feeling. Suraksha LPG hose, flame retardant aprons and energy efficient Green Label stoves are recommended to enhance safety measures while using LPG as cooking fuel. 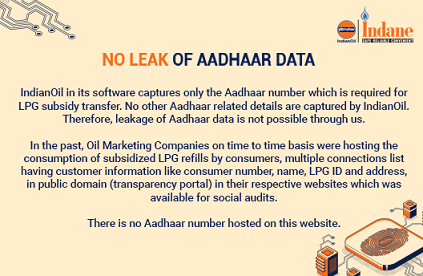 To access information on LPG Distributors of IndianOil, Official in charges, Toll-free and emergency contact numbers, please visit the support section on this page. Click here to know the service charges recoverable from customers by LPG Distributors and RGGLVs with effect from May 1, 2016.